Sun conjoins Venus. Mars sextiles Sun & Venus. Mercury sextiles Jupiter and conjoins Rahu. Jupiter trines Ketu. Saturn squares Jupiter. Moon signifies cusps numbers 9 & 10 through placement and lordship. Moon in the star of Moon and sub of Jupiter. The bulls will win in the game of speculation today. Persons having Libra & AquariusMoon signs/Lagna (ascendant) may get financially affected today. They should refrain from money matters today. Sun conjoins Venus. Mars squares Moon and sextiles Sun & Venus. Mercury sextiles Jupiter and conjoins Rahu. Jupiter trines Ketu. Saturn squares Jupiter & sextiles Moon. Moon signifies cusps numbers 9 & 10 through placement and lordship. Moon in the star of Sun and sub of Jupiter. Though Astro-signals not clear today, but slowly slowly the bears are conspiring to control the game in near future. During the week, Moon will be transiting in Leo, Virgo & Libra. Jupiter in Cancer. Ketu in Pisces. Lord Saturn, Sun & Venus in Libra. Mars in Scorpio. Lord Rahu & Mercury in Virgo. Pluto in Sagittarius. Neptune in Aquarius & Uranus in Pisces. PLANET MERCURY, which controls our mind (Buddhi) is transiting in Libra & is in retrograde position from 4th October 2014 to 26th October 2014. Be CAUTIOUS, as one is likely to take wrong decisions, resulting in financial losses, depending on its position in individual horoscope. Technical Analysts / researchers can be worst affected (since Planet Mercury is significator of this profession). Persons with Aries, Gemini, Virgo & Libra rashi / ascendant need to be extra vigilant. OFFSHORE sector will be receiving strong astrological support. Buy Dolphin Offshore, ABAN Offshore, Duke, Deep Industries & Selan Exploration etc on every decline. AUTO sector will continue getting strong Astrological support. Buy Hero Moto, TVS Motor, Maruti, M&M, Ashok Leyland, Escorts, Force Motor, Eicher Motor ect on dips. This sector was predicted last week also & during the week –SML Isuzu, Bajaj Auto, TVS Motor & Hero8 Moto moved up by 4-6% from weekly low. HOSPITAL sector will also be receiving astrological support. Buy Apollo Hospital, Fortis Health, Kovai Medical & Poly Medicure ect. PHARMA sector will also continue receiving astrological support. Buy Dr Reddy, Divis Lab, Lupin, Ranbaxy, Biocon & Auro Pharma on every dip. This sector was also predicted last week & during the week – Lupin, Unichem, Jubliant Life, Indico Remedies, Shasun Pharma & Hester Bio went up by 4-13%. To know, which sectors will be receiving strong astrological support in current Samvat 2071 & to achieve maximum gains, please visit our web site: or telephone us at 9811738366. Sun squares Moon, sextiles Jupiter, conjoins Venus & Rahu. Mars sextiles Sun, Venus & Mercury and trines Jupiter. Mercury conjoins Sun, squares Moon & opposite Ketu. Jupiter trines Ketu. Venus squares Moon & sextiles Jupiter. Saturn squares Jupiter. Moon signifies cusps numbers 8 and 9 through placement and lordship. Moon in the star of Jupiter and sub of Rahu. The bears will control the game after midday. Sun sextiles Jupiter & conjoins Venus. Mars sextiles Sun & Mercury, trines Jupiter. Mercury conjoins Sun & trines Moon. Jupiter trines Ketu. Venus sextiles Jupiter. Saturn squares Jupiter. Moon signifies cusps numbers 8 and 9 through placement and lordship. Moon in the star of Rahu and sub of Rahu. The market will be driven by negative sentiments today. Persons having Cancer & ScorpioMoon signs/Lagna (ascendant) may get financially affected today. They should refrain from money matters today. During the week, Moon will be transiting in Taurus, Gemini & Cancer. Jupiter in Cancer. Ketu in Pisces. Lord Saturn & Mercury in Libra. Mars in Scorpio. Lord Rahu, Sun & Venus in Virgo. Pluto in Sagittarius. Neptune in Aquarius & Uranus in Pisces. Mercury will shift to Virgo on 16thOctober 2014. TYRE sector will be receiving strong astrological support. Accumulate Apollo Tyre, MRF, JK Tyre, Ceat & Balkrishna Industries ect on every dip. CEMENT sector will be receiving astrological support. Buy Ambuja, ACC, Indian Cement, Grasim & Heidelberge ect on dips. CAPITAL GOODS sector will also be getting strong astrological support. Buy BHEL, Crompton, L&T, Havels, Alstom & Siemens ect on decline. This sector was predicted last week also & during the week – Siemens, Havels, Crompton, Alstom & Bhel moved up by 5-16% from weekly low. TECHNOLOGY sector will also continue getting astrological support. Buy Infosys, HCL Tech, Tech Mahindra, TCS & Hexaware ect on dips. AUTO sector will continue getting strong Astrological support. Buy Maruti, M&M, Ashok Leyland, Bajaj Auto, TVS Motor, Force Motor, Eicher Motor ect on dips. This sector was predicted last week also & during the week – Bajaj Auto, Maruti, Hero Moto, Ashok Leyland, SML Isuzu & Escorts moved up by 3-11%. PHARMA sector will also continue receiving strong astrological support. Buy Glenmark, Sun Pharma, Cipla, Divis Lab, Ranbaxy, Auro Pharma ect on dips. This sector was predicted last week also & during the week – Star, JB Chemicals, Venus Remedies, Coral Lab, Kappac Lab & Arrey Drug ect went up by 7-45%. Offshore sector will also continue receiving strong astrological support. Today is International Day For Disaster Reduction. The day encourages citizens and government to build resilient buildings to overcome disasters. Today is also Columbus Day. This day is celebrated as the anniversary of the arrival of Christopher Columbus in America. Sun sextiles Jupiter & conjoins Venus. Mars sextiles Sun, Venus & Rahu and trines Jupiter. Jupiter trines Ketu, Venus sextiles Jupiter, Saturn squares Jupiter. Moon signifies cusps numbers 6 through placement and lordship. Moon in the star of Venus and sub of Venus. Bulls will show their true colours post lunch hours. Persons having Virgo & TaurusMoon signs/Lagna (ascendant) may get financially affected today. They should refrain from money matters today. Today Sun will enter in Chitra Constellation (Nakshatra). Sun sextiles Jupiter & conjoins Venus. Moon opposite Mercury & Rahu. Mars sextiles Sun, trines Jupiter & sextiles Rahu. Jupiter trines Ketu, Venus sextiles Jupiter, Saturn squares Jupiter. Moon signifies cusps numbers 5 through placement and lordship. Moon in the star of Ketu and sub of Venus. Bulls will fight with the bears to close the indices in the green. Panchaks are ending today. You may begin with all the auspicious things now. Also, Krishna Paksha (Dark Fortnight) of Kartik month is beginning today. Sun sextiles Jupiter, opposite Moon & conjoins Venus, Moon trines Mars, Mars sextiles Sun trines Jupiter & sextiles Rahu, Jupiter trines Ketu, Venus sextiles Jupiter, Saturn squares Jupiter. Moon signifies cusps numbers 5 & 9 through placement and lordship. Moon in the star of Mercury and sub of Mercury. Bulls will not leave their grip & will try to close the indices in the green. Today is Maharishi Valmiki Jayanti. This day is celebrated as the birthday of Maharishi Valmiki, the author of Ramayana and the first Sanskrit poet. Sun sextiles Jupiter & conjoins Venus, Moon trines Saturn, Mars sextiles Sun, trines Jupiter & sextiles Rahu, Jupiter trines Ketu, Saturn squares Jupiter. Moon signifies cusps numbers 4 through placement and lordship. Moon in the star of Jupiter and sub of Rahu. Volatility can be seen today, Bears jobbers should stay away between 11 am & 2:30 pm. Persons having Leo & AriesMoon signs/Lagna (ascendant) may get financially affected today. They should refrain from money matters today. During the week, Moon will be transiting in Pisces & Aries. Jupiter in Cancer. Ketu in Pisces. Lord Saturn & Mercury in Libra. Mars in Scorpio. Lord Rahu, Sun & Venus in Virgo. Pluto in Sagittarius. Neptune in Aquarius & Uranus in Pisces. FOOD PROCESS sector will be getting astrological support. Buy Jubliant Food, Heritage Foods, Britannia, Nestle, Milk Food, ADF Foods etc on dips. CAPITAL GOODS sector will also be getting astrological support. Buy Crompton, Siemens, Havels & L&T ect on every decline. AUTO sector will continue getting strong Astrological support. Buy Maruti, M&M, Ashok Leyland, Bajaj Auto, TVS Motor, Force Motor, Eicher Motor ect on dips. This sector was predicted last week also & during the week – M&M, TVS Motors, Ashok Leyland, Eicher Motor, & Force Motors moved up by 3.6-17% from weekly low. FINANCIAL sector wuill also continue getting astrological support. Buy Canfin Home, LIC Housing, Dewan Housing, Reliance Capital, Sundram Finance & Bajaj Finance ect on dips. This sector waspredicted last week also & during the week - Sundram Finance, LIC Housing, Bajaj Holdings, Bajaj Finance, Canfin Home & Muthoot Capital shot up by 7-22%. PHARMA sector will also continue receiving strong astrological support. Buy Sun Pharma, Cipla, Lupin, Divis Lab, Ranbaxy, Auro P harma & Granules on dips. This sector was predicted last week also & during the week – Cipla, Divis Lab, Sun Pharma, Granuiles, Auro Pharma, Wyeth, Pfizer & Wimtec ect went up by 3.7-20% from weekly low. LEATHER sector too will be getting astro support. Accumulate BATA, Relaxo & Liberty Shoes on every dip. Eid-Ul-Juha (Bakrid) will also be celebrated today. On this day, Muslims sacrifice a goat or Bakr (Urdu) to commemorate the sacrifice of Prophet Ibrahim. Moon sextiles Mercury & squares Venus, Mars sextiles Sun & trines Jupiter, Jupiter trines Ketu. Moon signifies cusps numbers 10 & 2 through placement and lordship. Moon in the star of Ketu and sub of Mars. 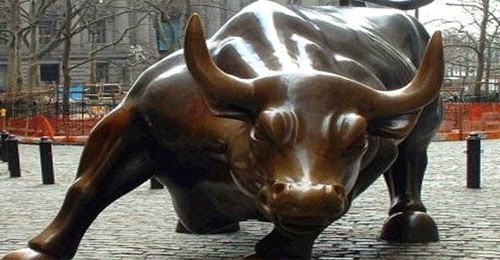 Initial tug of war between the bulls & the bears will be controlled by the bulls till 12:52 pm; thereafter, bearish to sluggish movement will be observed.